Folk song - is a song transferred from one generation to another without knowing who the composer was. The song contains the different aspects about the people, places, beliefs, values, and their ambitions, or dreams. The word Mindoro comes from a word "Mina de Oro" which means the place has lots of gold or rich with gold deposits. Ma-I is the first name of Mindoro. But when Asian coutries like China, Malaysia, Indonesia, and Arabia came to bring in their merchandise during the 10th century, the place was completely changed into Mindoro. The island of Mindoro is situatued 25 miles north of Luzon. Mindoro is divided into two region, the Oriental and Occidental according to Republic Act No. 305. This place is included in Region IV or Southern Tagalog. The capital city of Oriental Mindoro is Calapan, while Occidental Mindoro is Mamburao. At present, people living in Mindoro are christianized Filipinos, lowlanders, and several ethnic groups. They believed that only the Mangyans are the only ethnic group inhabiting the area. At present, the Buhid tribe of North Mindoro are always mistaken as Mangyans. But it is in Southern part of Mindoro where the true Mangyans are found. The word Hanunoo is not the name of the tribe itself. But the word was added to emphasize that they are the true Mangyans. Hanunoo Mangyans are nomadic. They have no permanent residence. They transfer to a place where there are plenty of food to eat. History tells that they retreated to the mountains when the Philippines was christianized. They were called Dumuong or Damuong which means they arrived by banca. Like any of the ethnic tribes, they seem to be an alien in their own native land. Their ancestral lands were gradually occupied by selfish and greedy Filipinos and foreigners. For this reason, their land ownership were ultimately lessened to a meager portion. The only hope is for them to go back to their ancestral lands and live a peaceful life. The Hanunoo Mangyans are generally peaceful and generous, which was greatly abused by Filipinos and foreigners. Although their lives became miserable, they were able to keep or sustain their art and culture. Some like their "script" writings which is similar to the Sanskrit of India, was preserved. The Ambahan is a lyrical chant song of the pure Mangyans. It is composed of seven syllables in one line that rhyme. The number of lines found in several Ambahan ranges from three to 134. There is no specific tone style or instrument used as accompaniment. The aim of Ambahan is to show the uniqueness of chanting. This depends in the way the music is delivered or presented. If ever a Mangyan likes an Ambahan, it is rewritten in a bamboo tube called "Luka" to remember the song every now and then. 3. To the elders - to share their rich experiences of life. 4. To the society - to maintain the correct habits, beliefs, and ceremonies, and rituals of their ethnic group. 5. Everyday use - for entertainment either historical or depending on the occasion. Sangdan way towo ngaran Are you not a human? Man? Satales balsigan To his dwelling place his home? 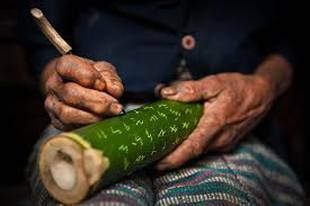 Usually, if a Manyan discovers one beautiful Ambahan, he inscribes it to a bamboo so that this can be taken cared for, taught and passed on to the next generation. Even if some Mangyans cannot read Ambahan script, they can understand if for this is being recited since their childhood. Hanunoo ambalan reproduced from a luka. This is an example of ambalan (Portuna 1974) which is curved into luka according to Mangyan script. 1. Gitgit - an instrument with 3 or 4 strings. It has a wooden body. The hair of a person is used as strings for the bow. 2. Batiwtiw - an instrument made from a bamboo. The strings are tied at both ends. At the center of the instrument there is fret. The strings are plucked and the sound is "tiw-tiw." 3. Kinaban - called a jaws harp which is made from a bamboo. 4. Kudlong - a zither made from a bamboo with two strings. A kind of a rattle made from "bean pod" together with other instruments like kalutang (two wood sticks). Several pairs of wood nailed at both ends with intervals of 2,3, and 4 and produces harmony. This ensemble is used for hiking. Made up of two gongs played by two males sitting on the floor. One plays at the rear of the gong while the other one plays at the embossed portion of the gong. A stick with a cotton pad at the end of the stick is used to strike the gong. Both players used the duple time. Flutes that maybe blown by mouth or nose.